Gangtok, the capital of Sikkim, is situated in the midst of the eastern Himalayas. An important centre of Buddhism, this charming hill station is surrounded by beautiful scenery at every step, especially stunning views of the snow-capped Mount Kanchenjunga. 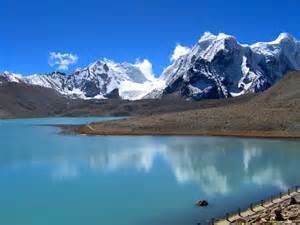 It is also a good base to visit Sikkim’s Buddhist monasteries, high-altitude lakes and passes. Perched on a hill top above Gangtok’s ridge, the Enchey monastery offers picturesque views of the town and the Kanchenjunga peak. Built in 1909, it follows the Nyingmapa tradition of Tibetan Buddhism. Surrounded by rugged mountains on all sides, this scenic lake is located at an altitude of 12,000 feet, around 35 kilometres away from Gangtok. Located on a hill facing Gangtok, Rumtek is the largest monastery in Sikkim. The Tibetan-style monastery the seat of the Kargyupa sect of Buddhism and a near-replica of the Kagyu headquarters in Tibet. Established in 1958, this institute has one of the biggest collections of Tibetan artefacts outside Tibet. It has been built in a traditional style, and promotes research in Tibetan culture and Mahayana Buddhism. Gangtok is dotted with innumerable viewpoints, which offer spectacular vistas of the surrounding hills, especially Kanchenjunga, the third highest mountain in the world. Ganesh Tok, 7 kilometres northeast of Gangtok, is the best of the lot. The Nathu La pass was an important corridor between India and Tibet before it was closed in 1962. Situated at an altitude of 14,450 feet, it was part of the historic Silk Route that was used for trade between China and India.